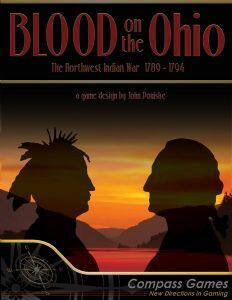 The Miami and Shawnee were the principal tribes involved but in time they created a loose alliance with numerous other tribes and together they dealt the U.S. the worst defeat by Indians in the history of our Indian Wars. Washington sent three separate expeditions against them. The first two were handily defeated. The third and final expedition led by General "Mad" Anthony Wayne ended the conflict with his victory at The Battle of Fallen Timbers in 1794. This design is similar to KING PHILIP'S WAR published by MMP in 2010. 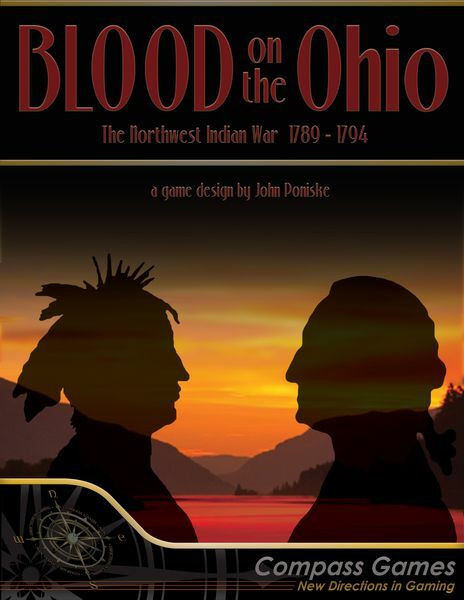 It is point to point movement, using a three dice simultaneous battle system with variable reinforcements on both sides, special action points, alliances and treaties, and frustratingly undependable American militia. The American army operates out of forts, the Indians out of villages. Every two turns both players enter into quartering which in effect resets the board. Destroyed Indian villages are relocated while additional forts and settlements may be built as the game progresses. Indians raiding is a quick and simple mechanism that adds color to the game. The action is hardly battle-line simple. Engagements are widespread and chaotic with surprises at every turn. Four scenarios are included - one per expedition with a campaign game that encompasses all three. Low counter density with quick and tense game play. Simple to learn.